Back again after a week's hiatus. This series is really turning into more of a "toy every two (weeks)", but you can't complain about the price... 🙂 I had a few different requests over the past couple of weeks, and the two that sounded the best to me when it came time to make this video were the Intex gator and BDUs, or popping and "ripping the dolphin to shreds." Both ideas got me excited, so I flipped a coin and ended up with BDUs and the gator. Decided to wear my armored SWAT vest too, for a bit more visual impact. I think it looked pretty good. As usual, hope you all enjoy... I had a really good time riding and abusing that gator. It took a surprising amount of punishment, too, before it finally popped. The Intex realistic toys use really soft vinyl, and feel soooo good to grind against. As is my new norm, the remains of the gator are available to anyone who wants to pay for shipping. It's a modern toy and has some pretty big damage, so I suspect nobody is going to want him, but if you do, head over to the Used/Abused toys page and send me a mail. As usual, you'll be responsible for shipping costs. This entry was posted on Thursday, July 20th, 2017 at 8:31 pm by Mr. MotoX in the category Videos. 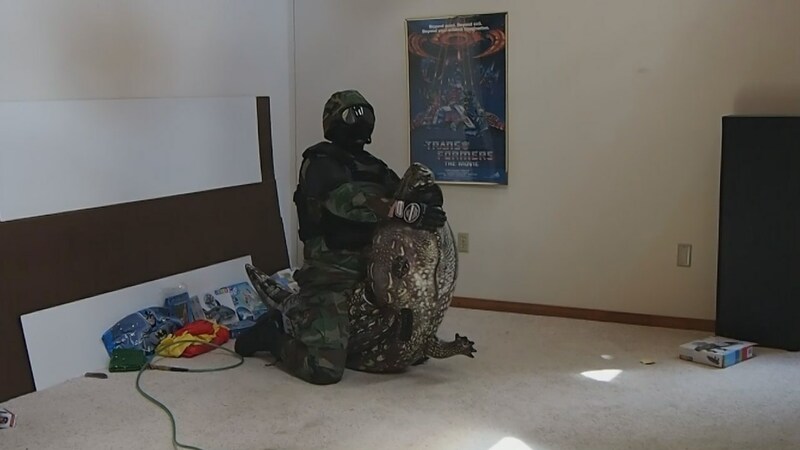 + Show - Hide 5 comments on "Toy-A-Week #20: Armored Soldier vs Realistic Gator"
Anouther AWESOME kill big guy. Gear up in leathers then get on top of batman and use that patented MrMotoX pressure to bust him.